Brian Wilson gave The Beach Boys their sound, their early hits, and their direction. This is an introspective look at his music — and his madness. 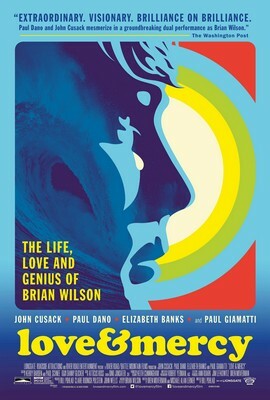 With the number of Beach Boy biographies and made-for-TV movies, most of those who want to know his troubled story must already know it. This version adds no new information. What’s new are superior acting, powerful moments, and interesting casting. There are two Brians in this movie, played by two actors – Paul Dano and john Cusack. We meet both in the first ten minutes and for the remainder of the film we’ll cut seamlessly and often between them – into a life unraveled. The story is told in a non-linear way that adds depth, interest, a sense of pace and dimension. As we move between the Brians, we spiral persistently downward into weirdness accompanied by demons, some more physical than others in a story that has no beginning, middle, or conclusion; it’s all a collection of moments large and small, snippets of time and music, a life more complex than the harmonies he created. It’s a life controlled by heroes and villains, and those looking for a celebration of Beach Boys music – or further understanding of a group that lost its harmony – should look elsewhere; music plays a background role. Much of the movie has the look of something made for TV that somehow found its way to the theatre. Dialog often seems contrived, trying to communicate too much too quickly. Too many scenes play over long silences that – like the movie itself – are on screen too long. At one point, Brian reflects: “It’s a lot harder than I thought it would be.” He’s talking about a recording a piece of music; he could be describing his life.